SOUTH CAROLINA – As teams from multiple agencies try to save people from their cars on flooded streets across South Carolina, officials are struggling to keep count, the state’s emergency management spokesman told CNN on Sunday. “It’s a historical flood the likes of which we haven’t seen,” Eric Rousey said. Most of the rescue operations are being staged in Dorchester and Charleston, where at least 30,000 people are without power. Emergency officials said there were about 140 water rescues in Dorchester overnight. 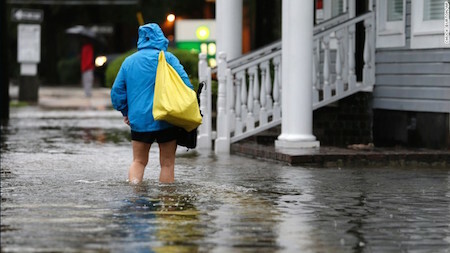 In Charleston, people paddle kayaks and canoes down city thoroughfares, as more than 6 inches of rain fell in downtown on Saturday, according to the National Weather Service twitter account. On Saturday, about 11 1/2 inches of rain had fallen in the city, the weather service said. That’s an inch more than the all time daily highest amount of rain in the area, recorded in September 1998. Of the 83 road closures throughout the state early Sunday, 46 were in Charleston, Rousey said. President Barack Obama has declared an emergency and South Carolina, authorizing federal aid in anticipation of more rain. The weather service forecasts “catastrophic flash flooding” overnight into Monday in Berkeley County in South Carolina, were more than 18 inches of rain had fallen in 24 hours, according to the CNN weather center. The situation is so extreme that the helpers are in need of help as well. “Four additional swift-water rescue teams are coming in from out of state to assist with South Carolina rescues,” the South Carolina emergency management division tweeted. Also, several fires have been reported, a report stated, because water has seeped into electrical circuits. Officials are warning that if water is coming into a home, breakers must be cut immediately.